Sugar cubes are so easy to make at home. 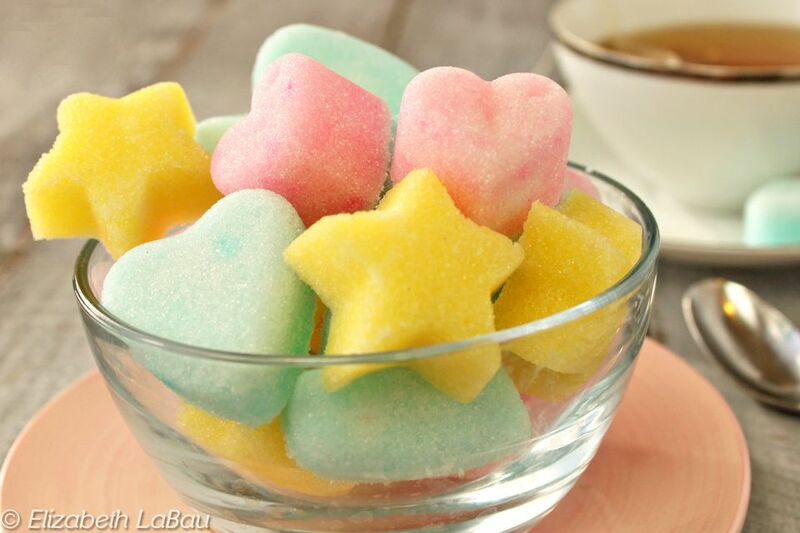 You can dye and flavor the sugar, then use candy molds to form it into fun shapes. This method is perfect for crafting sweet bites for birthday parties, baby or bridal showers, or holiday meals. Serve them alongside your favorite tea for a truly elegant presentation. Place the sugar in a bowl, and add the water. Stir until all of the sugar is moistened. If you want to add coloring and flavoring, add just a tiny bit of color and the flavoring, and stir everything together. If the color is not dark enough, continue to add a small amount and stir it in a bit at a time—it's better to be cautious than to add too much and have a color that's too dark. By the end, the sugar should have the texture of wet sand and clump together when you squeeze it in your palm. If it seems too dry, add a small spoonful of water at a time until you get a workable texture. Use a spoon to heap the sugar into the mold's cavities and then firmly press it down into the mold. Make sure that you compact it well so that it holds together and takes the form of the mold well. Once all the cavities are filled with packed sugar, use a brush or a pastry scraper to remove any excess wet sugar from the tops of the molds. For the best results, the sugar should dry completely before being removed. You can let it sit out at room temperature, where it might take anywhere from an hour to overnight for the sugar to be set enough to remove—it depends on the consistency of the sugar you started with, the humidity, and the depth and size of the molds. Alternately, if your molds are microwave-safe, you can microwave them for a short period of time to remove moisture from the sugar and speed the drying process. All microwave times will vary but start with 25 to 30 seconds. Let the mold cool briefly after microwaving, then trying gently flipping out the sugar shapes. Adjust the microwaving and resting time as necessary to get the cleanest shapes upon removal from the molds. After the shapes are removed, let them sit at room temperature to make sure they're perfectly dry all the way through. Sugar cubes can be kept indefinitely in an airtight container at room temperature. They are fairly sturdy but do be careful packaging them, as they are also brittle and can be scuffed or broken. For an additional treat, omit the flavoring extract and make these sugar cubes with flavored sugars instead, such as vanilla sugar, lavender sugar, or lemon sugar.